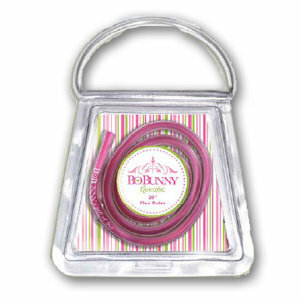 Bo Bunny's 20" flexible ruler is perfect for the hot new trend of wavy borders on layouts, cards and more. Use it to create swirls and circles or any shape you can bend it to. 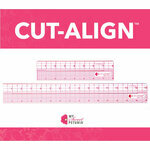 Simply trace around the end of the ruler and cut out the desired shape. 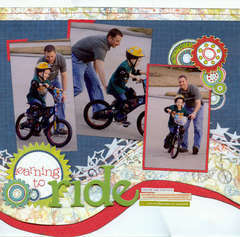 Definitely a must have for every scrapbooker and paper crafter. This tool has just recently been added to my collection but I really like it. I have used it a lot more then I thought I would. It really holds shape. That was my biggest concern. I have seen in demos where people trace with a ruler then cut their traced line. 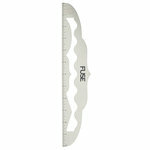 I just use the exacto knife right along the ruler and have not had a problem at all. With either the ruler losing its shape or the cut not working. What I would like to see in the future is maybe it being a big magnet so I could use it with my Basic Grey mat. LOVE! LOVE! 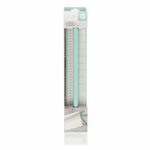 LOVE this RULER! 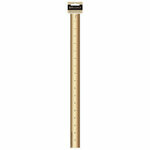 I ABSOLUTLEY LOVE this ruler! I use it ...LITERALLY...everyday! The ruler has been such a MAJOR tool for when I finished my Vacation album for my families vacation to Punta Cana. I was able to shape the ruler to resemble waves, and then cut various colored cardstock & vellum to mimic the water...and WOW...the album came out FAB-U-LOUS!!! 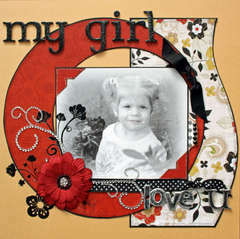 This tool also helps me when I create scrapbook pages how to be creative with the layout of my photos. It helps me think "outside the box"!! 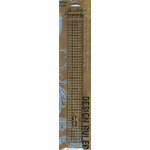 I let this ruler sit for a bit before i used it !! Don't know why !! I love using it. I just love how you can shape it set it on the paper and get a idea if ya like the design and move it a little here and there until you get it the way you like it. I often use it on that thin white cardstock you get in your new albums to trace a design on to see if I like it. Then if i like it I just set it on my pattern paper make a light pencil line and cut it out. Easy as that !!!! I wasn't sure if I would like this or not, but I fell in love with it the first time I used it! It makes great curvy lines and I'm sure I will discover more uses for it the more I use it. It's lots of fun and has a ruler right on it. It is 20" long so that you can bend it and it still goes all the way across a 12" page. I wanted to cut more than one "wave" exactly the same as the last and this ruler holds the shape until you bend it again. I saw this ruler in a magazine and knew that I had to have it! It is so easy to use and it can be used so many different ways! I use it for both cards and 12 x 12 layouts. It is so much fun! It allows me to do things on my pages that I never could free hand. I would definitely reccomend this product to a friend. It's a great addition to your scrap stash! I have used the flex ruler so much. I find that working with it can be such a fun part of the creative process. 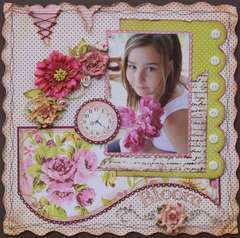 Sometimes I lay out my photos and elements, then work with the ruler to decide on how I want my patterned paper. It really helps me visualize my layout. This this rocks. It has a good weight to it so it doesn't get shoved around easy, yet it's not weirdly heavy. I love the fact that you can repeat the same pattern over and over again with it. I like to shape it around solid objects to make patterns. When I bought this tool I thought I had wasted my money, I was so wrong. A super tool. It helps making that beautiful curve and also making multiple curves that are the same. It also helps making a smooth curve, which I had trouble doing freehand.